The youth sensation of Telugu Industry, Actor Vijay Devarakonda became the only actor being named in Forbes’ Indian 30 under 30 2019. 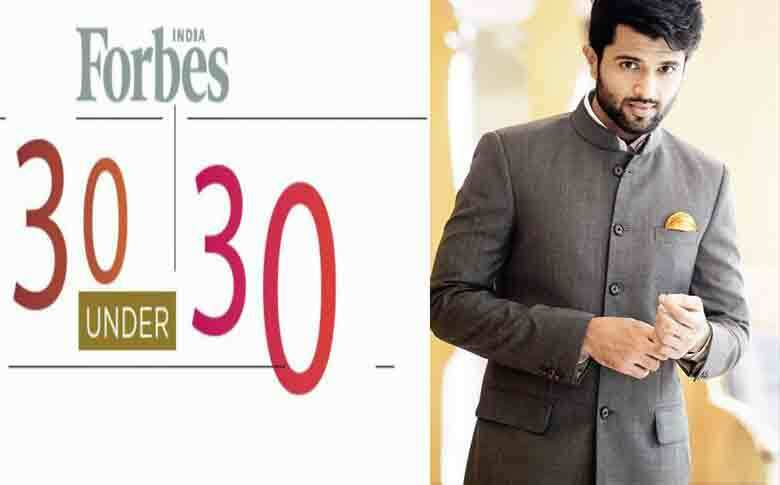 Forbes’ India 30 publishes the list every year appreciating young achievers under the age 30 in the field of business, entertainment, music, and sports. The actor is placed 29th position in the list. The actor took to his social media handler and shared his happiness about the news. He said that, when he was 25, he had only Rs 500 in his bank account. His father had advised him to settle before the age 30 and can enjoy his life later. 4 years later, now in the list of Forbes Celebrity 30 under 30’’. The actor rose to a household name through his movies “Pelli Choopulu’, ‘Arjun Reddy’, and ‘Taxiwaala’. The actor has a strong fan following and his fan-base is spread across the state. Meanwhile, in work front Actor is currently busy with Dear Comrade which stars “Geetha Govindam” fame actress Rashmika Mandanna as the female lead. Actor Vijay is also busy with an untitled project with Director Kranthi Madhav.